(James Franco) hit the yellow brick road. Almost an hour of Disney's "Oz The Great and Powerful" goes by before this campy and inconsistent prequel introduces its real star. Forget flakey James Franco's hammy would-be wizard, vacantly wide-eyed Mila Kunis as a conflicted witch on the verge of wickedness or wily Rachel Weisz as the emerald-draped essence of evil. The story finally gets some much-needed heart in the form of the foot-tall, marionette-like China Girl (voiced by Joey King). She is the cast's most consistently convincing character, despite the fact that she happens to be computer-generated. Like Dorothy Gale in 1939's "The Wizard of Oz," circus magician Oscar "Oz" Diggs inadvertently rides a tornado from black-and-white, early 20th-century Kansas to the colorful dreamlike fantasyland that shares his name. Some residents he meets there (human and otherwise) are doubles of people he knew back home, he travels a yellow brick road through a dark forest with unlikely companions, and he is tasked with killing a wicked witch. Sound familiar? But where the focus in the classic original film stayed almost exclusively on Dorothy and her friends, "Oz The Great and Powerful" makes the mistake of devoting far too much screen time to the soap operatics of conniving sister witches Theodora (Kunis) and Evanora (Weisz). Even worse, Franco plays the title character so broadly that he often seems less like a lovable rogue than a distracted doofus. Robert Downey Jr., who originally was cast in the role before dropping out, may have been able to make Oz a deeper and more believably conflicted con man. Franco isn't helped by director Sam Raimi, who regularly undercuts moments that should be moving or dramatic by tainting them with slapstick, bad pacing or inappropriately graphic violence. Raimi displayed the same faults with his unsatisfying (although commercially successful) "Spider-Man" trilogy. Although the movie is burdened with an irritatingly wall-to-wall Danny Elfman score, it features no songs with lyrics except a Munchkin ditty that is cut mercifully short. But its up-front "Over the Rainbow" emotional moment should have come when a disabled girl attending Oz's Kansas sideshow asks the magician to make her walk. Instead of that scene getting its rightful tear-jerking due, however, it quickly is hijacked by laugh-getting outrage from cartoonish fellow audience members. The movie's best scene replays that encounter in the land of Oz, where the magician finds the doll-size China (as in dinnerware) Girl with broken ceramic legs in a town of smashed teapots and such. It's a shame that the rest of the movie couldn't have been played with the same kind of unwinking sincerity, instead of relying so heavily on "what hath Tim Burton wrought" irony. The spunky and thoroughly charming China Girl teams with Oz and his wisecracking flying monkey Finley (Zach Braff). They eventually join forces with good witch Glinda (a maternal Michelle Williams) to try regaining the Emerald City using cleverly devious but non-deadly force. Although Glinda recognizes that Oz is "weak, selfish, slightly egotistical and a fibber," she also detects a goodness within him that he refuses to acknowledge. While the CGI characters are well rendered, the production design is undeniably elaborate but indefinably "off." Burton's 2010 "Alice in Wonderland" (also produced by "Oz"'s Joe Roth) is the obvious template for the film's lushly phantasmagorical look, but many studio-bound scenes (especially one in a graveyard) are as artificial as a studio-tour attraction. The overall effect is "expensive but schlocky." The screenplay by Mitchell Kapner and David Lindsay-Abaire has some clever bits, especially a few tricks at the end that set things up for events in "The Wizard of Oz." What's too bad is that the final act also includes what has become the standard action-movie "hero beatdown," in which a bound and helpless Glinda takes a rather child-unfriendly level of punishment from the other two witches before getting into a one-on-one knock-down wand battle. Also, parents of very young children should be aware that the wicked witch's huge-toothed flying monkeys are much more frightening than their relatively innocuous equivalents in "The Wizard of Oz." 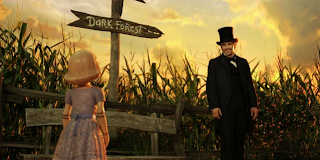 Although the basic plot of "Oz The Great and Powerful" probably made for an intriguing pitch, the actual film doesn't come close to matching the timeless storybook sincerity of its 74-year-old predecessor.